India is facing its worst-ever water crisis, with some 600 million people facing acute water shortage, a government think-tank says. The Niti Aayog report, which draws on data from 24 of India's 29 states, says the crisis is "only going to get worse" in the years ahead. This would also threaten food security as 80% of water is used in agriculture. Indian cities and towns regularly run out water in the summer because they lack the infrastructure to deliver piped water to every home. Rural areas are also badly affected by a lack of access to clean water. They cannot rely on groundwater due to erratic rains and the fact that the groundwater is increasingly used for farming when monsoon rains are delayed or insufficient. Around 200,000 Indians die every year because they have no access to clean water, according to the report. Many ends up relying on private water suppliers or tankers paid for them by the government. Winding queues of people waiting to collect water from tankers or public taps is a common sight in Indian slums. As cities and towns grow, the pressure on urban water resources is expected to increase - the report estimates that demand will be twice as much as available supply by 2030. Water scarcity would also account for a 6% loss in India's gross domestic product (GDP). Some Indian states, however, are doing a better job than others in managing their water. Gujarat in the west topped the report's rankings. It was closely followed by Madhya Pradesh in central India and Andhra Pradesh in the south. Fifteen of the 24 states scored better than they did the previous year, leading to one of the report's conclusions that "water management is improving across-the-board". But what remains alarming is that the states that are ranked the lowest - such as Uttar Pradesh and Haryana in the north or Bihar and Jharkhand in the east - are also home to nearly half of India's population as well the bulk of its agricultural produce. But, the report said, policymakers face a difficult situation because there is not enough data available on how households and industries use and manage water. 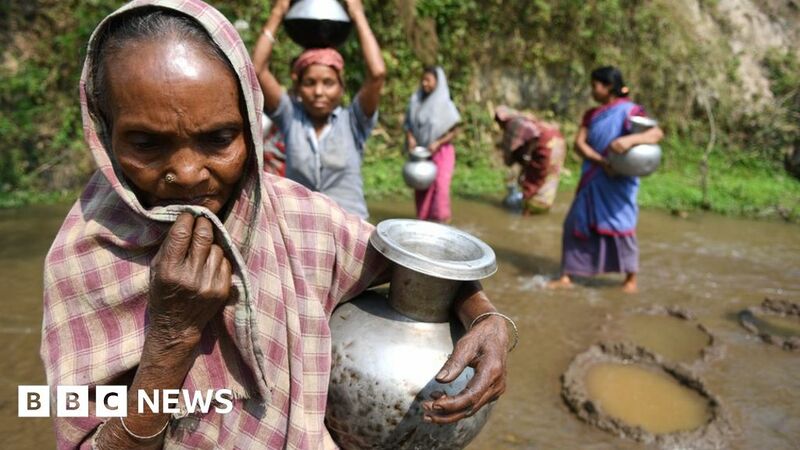 Some 600 million Indians are facing an acute shortage of water, a new government report says. Water that is safe and clean might be easily available today but 600 million Indians face high to extreme water stress and about two lakh people die due to inadequate access to safe water every year according to the Niti Aayog’s Composite Water Management Index 2018. Many have to walk miles or spend hours or do both every day just to fill a few buckets that are most likely neither clean nor safe. Seven shortlisted #WaterFellows have documented the story of water: the crisis and the solutions across urban and rural communities in India as part of WaterAid India’s first ever photography fellowship, ‘The WASH Photo Project 2018-19’. The exhibit is on March 22-24, 2019 in Delhi. And what happened to all the talks about grand linking of rivers across the country ?? Like the 300 smart cities, Ganga cleanup, ache din, Sabka sath Sabka Vikas, this too goes under the carpet like the pushnikai !! Truly this govt is all talk and no action. On what basis the right wingers are asking people to,vote for this govt ??? First of all, providing water to the general public is State subject. Elected Parties ruling the State Government are responsible for this. There is already Inter-State Water Disputes in South India as well as other States with each State being ruled by different political parties. As for Central Government, this Government is not about talk, it is action oriented. goebbelistic propaganda of medias and never pay attention to facts and to verify the actual progress being made. Government has initiated action to provide safe drinking water. A senior official said the water resources and river development ministry, led by minister Nitin Gadkari, has lined up Rs 45,000-crore worth of development projects to interlink four rivers in the first phase of this initiative. Prime Minister Narendra Modi's ambitious Rs 5.5 lakh crore Rivers Inter-link plan is a large-scale civil engineering project that aims to link rivers through a network of reservoirs and canals across India. The mission of this programme is to ensure greater equity in the distribution of water by enhancing its availability in drought-prone and rainfed areas. On the contrary, only the idiotic dull heads and dunces will believe that this govts is all action based on empty jumla promise of some funds being lined up, after they have wasted 5 yrs with unprecedented majority. Why has the entire river linking project not been started yet!? Atleast they could have made considerable progress on phase 1 ?? What were they doing for last 5 yrs ?? Fire fighting the disastrous mess of demo and GST instead of focusing on development ?? LOL. Andheri nagari, chowpat raja !!! LOL. The moment water becomes a political issue for getting votes, we can very well come to a conclusion that the crisis will not be solved. in power in states or the centre.We only indulge in blame game.The democratic processes are very slow. A simple issue of our population getting good and safe drinking water has not been resolved satisfactorily. drinking water, we engage only persist with blame gama and mudslinging..
Another good generation of politicians and bureaucrats will take over and resolve these basic issues. Only we senior citizens enjoy our retirement instead of lamenting about these issues. Lot of rain water is going into the sea. All Govts (State & Centre should start in right earnest to harness the resource. Jayalalitha's plan of rain water harvesting was a very good idea. After the election on priority basis Centre should convene a meeting with agenda on linking of rivers ( North as well as south), rain water harvesting, deepening the tanks and removing silt from dams. Let us perform abhisheka to Lord Siva for good rains chanting Rudram & Chamaka. Let us ask ourselves as to how many of us are serious about this water crisis..? How much attention do we pay in conserving water which is a very essential source for survival? Why we depend upon the local Authorities and pass the buck on the Government...?? We all do have a tendency to blame the Government for everything, when are the public going realize that it is also individual responsibility of conserving water. Reduced water consumption and water conservation are important subjects. In Tamil Nadu, the then Government passed an order making it mandatory to ensure installing Rain Water Harvesting system in every house. We have a traditional system of cultivation using more water to crops. We produce rice and wheat which are some of the highest water-guzzling crops. People talking about water crisis is not new, but one can find them watering their lawn and washing their cars with abundance of water twice a day, especially when acute shortage of water is felt on the other part of the nation. Preaching others is easy ........!! Look at the plight of hapless public who elected the 80 numbers of Congress Candidates for the Karnataka Assembly with all hope that they will resolve the burning issues….?? But Congress party appears to be very busy wrangling with JD (S) over every issue...? Public welfare pushed to back seat. It is said that when elephants fight, it is grass that suffers…. We have few with blinkers who conveniently overlook inaction of this particular party. Biased minds will never change. Mega infrastructure projects are certainly signs to rate the progress and growth of a developing country. Some members with Frog in the bottom of the well mindset wishes to see the country in poor light with temporary petty projects and swindle lion share. Only wise, with wisdom realize the significance of mega infrastructure projects and definitely NOT the narrow minded.